Sometimes, it can seem difficult to decorate a home on a budget, especially if you are looking for some dramatic, eye-catching decor options. One of the best ways to accomplish this, though, is to find affordable solutions for practical problems that can also enhance the overall style in your home. Air circulation can be a problem in just about any home, whether it’s large or small, new or old, or is using updated air conditioning or open windows. The solution is to purchase a few affordable but stylish fans that will increase air flow and keep your home feeling and smelling fresh. The good news is that there are several fan options for $50 or less that are practical and stylish at the same time. These affordable, dramatic fans come in every style from a sleek tower design that will match a modern aesthetic to a cute, vintage-looking, colored table-top fan perfect for a kitchen styled to look like a 50’s diner. Since fans are often a necessity in the hotter months, why not look for an affordable option that can double as a stylistic element at the same time? Ladders and trellises are a stylish way to add storage options and take advantage of smaller wall spaces in your home. These options are eye-catching as they can be placed flat – or nearly flat – against a wall and are an unexpected accessory that makes the most of the upper wall space in a room. Ladders and Trellises can be bought inexpensively, especially if you are willing to look into secondhand options. A simple flat wood ladder can also be built easily with reclaimed or scrap wood. A ladder can be the perfect way to store and display blankets and throws in a living room. Ladders are also great for small spaces like bathrooms or storage rooms where there may not be a lot of functional space. Trellises come in all shapes, sizes, and colors and can be used to hang shoes or, with the addition of small hooks, jackets, bags, or scarfs. With a little imagination, there is really no end to the different ways you can use these items in your home as practical, stylish accessories. Rope is often an underutilized accessory in homes, but it can be used for a variety of practical purposes while simultaneously adding some interesting texture and unexpected design to your home. 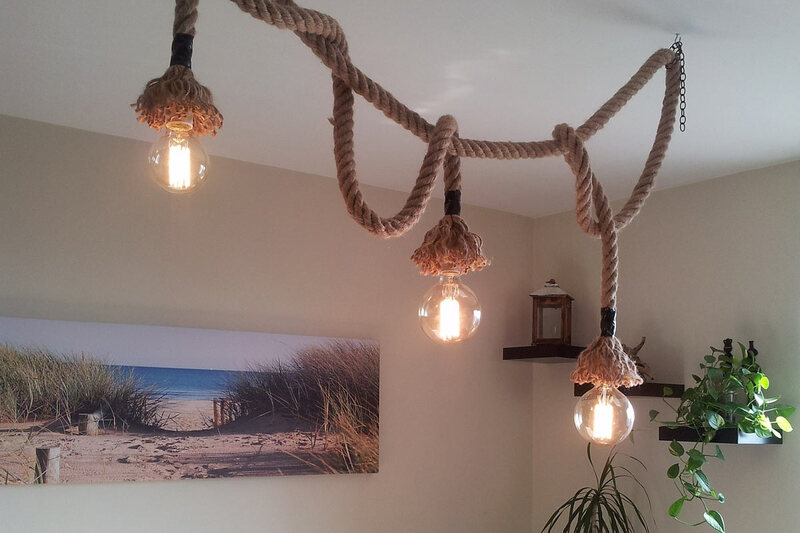 Thick, heavy-duty rope goes especially well with any beach, nautical, rustic, or industrial decor, but it can also be worked into a variety of styles that rely on warm colors, earthy tones, or a cozy atmosphere. Rope can be used to hang up curtains in lieu of curtain hooks, or as tiebacks for curtains and swags. It can also be used to hang pictures, mirrors, and lanterns. Rope can be combined with simple boards to hang rustic floating shelves for those areas where you may not have enough floor space for a traditional shelving unit but could use some more storage. You can also use rope for drawer handles, stair railings, or even rugs! Some of these ideas require some crafting skill, but there are almost endless possible ways you can work this often overlooked material into your home in a way that is sure to add drama and creating talking points in any room. The next accessory you can used to add some practical style to your home is accessories themselves! Making a tastefully arranged wall display out of hats, jackets, scarves, or even jewelry is a great way to meet your need for storage while showing off your belongings that reflect your sense of style. If you have some brightly-colored hats that need to be stored safely somewhere, try hanging them directly on the wall in an artfully-arranged grouping. A beautiful iron scroll work coat rack can add some style to your entryway while giving people a place to store their coats next to the door. Hanging hooks for jewelry or scarves come in a variety of cute styles; choose one that fits the design of your room, or mix and match several styles and colors for a care-free way to add color and texture to your space while giving you a place to store your accessories. One of the most popular ways to meet a practical need while adding to the overall style of your home is to use storage options in place of your usual surfaces. For example: An old-fashioned, flat-topped steamer trunk makes a great coffee table while still giving you a place to store seasonal decor. Trunks also make great benches for the entry way or foot of the bed. You can buy or make a cushion to go on top that will perfectly match the feel of your room. You can also paint most wooden trunks to better reflect your aesthetic. You can often find trunks secondhand at consignment shops or, if you are really handy with tools, you can build your own from reclaimed wood pieces or pallets. If you find yourself short on space and storage, keep in mind that a half bookshelf can serve as both a bedside table and a display space. You can also use short shelving units or small cabinets as side tables and entryway surfaces to further make the most of your space while getting the most practical use out of your furniture. The key to adding affordable, practical, dramatic style to your home is to use every-day things in unexpected ways. Do this, and you won’t have to break the bank buying expensive decor designed to look dramatic. Instead, create your own unexpected experience while meeting practical needs in your home.